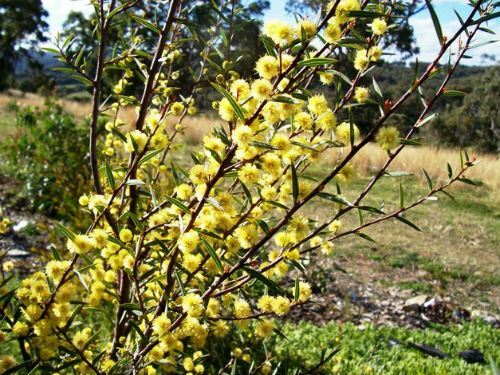 Acacia siculiformis is known as the Dagger Wattle and is an upright shrub reaching a height of two metres. The common name is apt as the phyllodes are dagger-shaped and come equipped with a sharp point. They are about 30 millimetres long by 2 millimetres wide, rigid with a small gland near the centre of phyllode. Individual globular flower heads are held in the axil of each phyllode. Blooms are mid yellow and appear in spring and early summer. Acacia siculiformis is a handsome if somewhat prickly shrub and perhaps should not be planted beside paths. The Dagger Wattle has a wide distribution. In NSW the species is found on the northern and southern tablelands as well as the north-eastern highlands of Victoria and Tasmania. Both dry, rocky areas and watercourses are occupied by this species. This is one of the few wattles that could be cultivated in both moist and dry situations. Our specimens are surviving on our dry, well-drained hill. Acacia siculiformis is common along the Waterfall Way, east of Armidale where it grows beside creek and wetlands. The type specimen appears to have been collected at Rocky Hill near Lake George, ACT in 1842 by Alan Cunningham.